Twelfth Night is the last day of Christmas and is traditionally the day the festive decorations are taken down in the UK. It celebrates Epiphany on the 6th January, the day the three kings visited the newly born Jesus. As well as consuming the hot and spicy punch called wassail, a cake used to be baked with a bean stuck inside it. Whoever got the bean became King for the rest of the day. This has largely died out here, although the custom is still alive in many parts of Europe, especially France and Spain. I ended up adapting Ruby Tandoh’s recipe for Lemon & Marzipan Cupcakes from her book Crumb; it had been tempting me for some time. However, in my eyes, these are not cupcakes. Cupcakes have some sort of icing on top and these ones don’t; there is plenty going on without it. I made them a bit more lemony than Ruby, included one of my favourite spices, cardamom and changed a few other ingredients. The result was superb: a definite lemony zing and sharpness with subtle notes of cardamom coming through and bursts of sweet caramelised marzipan. Sharp zingy lemon cakes with a light sponge. Subtle notes of cardamom add depth and the marzipan melts to give a certain sweet almondy stickiness. 200g marzipan - half grated, half cut into small cubes. Grate in the zest of the lemon, add the ground cardamom and cream a bit more. Sift in the dry ingredients and stir. Juice the lemon and stir in gently with the grated marzipan until everything is just combined. Gently stir in the cubed marzipan. 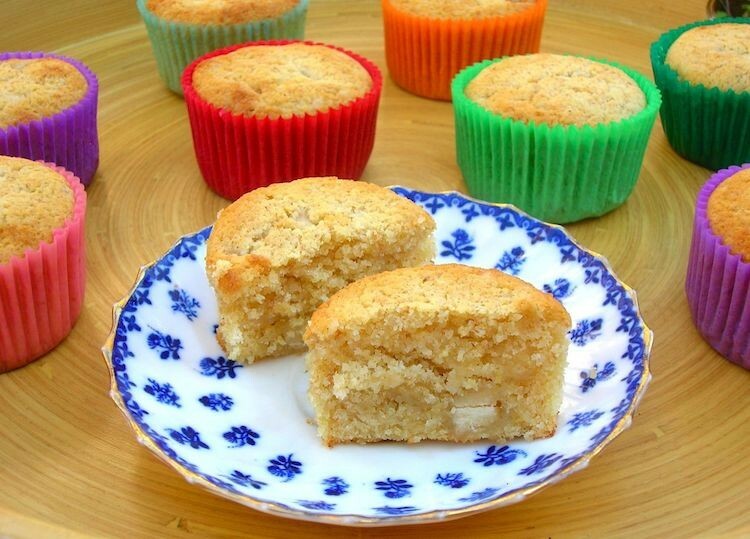 Spoon into twelve cupcake cases and bake at 180℃ for about 20 minutes or until the cakes are golden and well risen. Allow to cool for a couple of minutes, then turn out onto a wire rack to cool completely. This is a great way to use up leftover Christmas marzipan and as such I’m sending it to Elizabeth’s Kitchen Diary for the No Waste Food Challenge. For similar reasons, these Twelfth Night cakes go to Love Cake over at JibberJabberUK. I don’t think I can claim these cakes are healthy, but they do include lemon, so I’m sending this off to Kat at Baking Explorer and Cakeyboi for this month’s Treat Petite where the theme is fruit and veg. Dom over at Belleau Kitchen tells us we need a healthy element in our Simply Eggcellent recipes this month. Well there’s not a great deal that’s healthy here, but I did use wholemeal flour and almonds are ever so good for you, so I’m winging it. 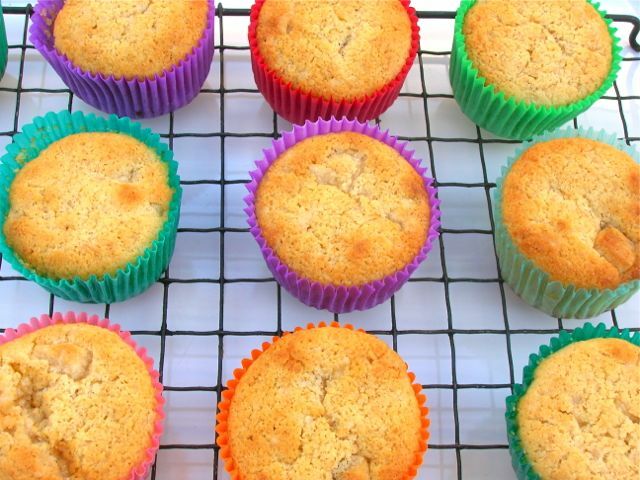 I love the mixture of flavours that you’ve used and those bright cupcake cases are fantastic! Thanks for entering into Treat Petite. Thanks Kat. These are my favourite cases, but I bought them years ago and haven’t come across any similar since. The little cakes look really lovely, anything with marzipan gets my interest! Thanks Heidi, I’m a big marzipan fan too. Love the sound of these and I have loads of leftover marzipan – result! I know exactly what you mean about *meaning* to do something for 12th Night! Only… I never do. These sound so delicious though! Thanks Alicia. My life is paved with *meaning*!!! Thanks Lisa, it’s a really big celebration in some parts of the world, but seems to be mostly forgotten over here. Oh yes Nadia, you must try it. I’ve used lemon, almond and cardamom together many times and the combination is a real winner. I greatly admire the fact that you made a 12th night cake. I used to bake something years ago and I always mean to do it again but never do. I think it’s because everyone I know is on a diet in January and refuses to eat cake. I’m currently more than a little obsessed by cardamom in cakes so this is definitely for me. The flavours are just right for this time of winter somehow. Cardamom is one of the most under rated spices there are … combine it with almonds and it really does shine! I’ve found it lovely in some Swedish cake recipes that I found in an old cook book of Scandinavian cuisine. Your little cakes look delish! Hello Susan, lovely to hear from you. Happy New Year. I wonder why the Scandinavians cottoned on to cardamom and we never did in the UK. Luckily things are changing now. Ooh these sound glorious, flavours when I adore. I must admit that I’ve never heard of a Wassail cake – it sounds very interesting., nor have I ever made a Twelfth Night Cake, I’ll have to try to remedy that next year! I am such a fan of marzipan and these cupcakes are an inspired way of using up the leftovers after making a Christmas cake. I love the lemon and cardamom flavours in them too. I love the combo of flavour of those little treats. They look so beautiful and tasty. Thanks Angie, I’m sucker for all of these flavours and definitely for marzipan. The excuse is, if ever you needed one, that the cakes are just getting rid of surplus Christmas ingredients! oh yes…. Lemon, cardamom and ground almond. I love the texture. Very nice… can I have one now please? Thanks for the history lesson! Your cakes look fab and the combination of lemon and marzipan sounds gorgeous. Haha Cathy, I used to love history at school, but sadly, I’ve forgotten far more than I ever knew. Luckily, the cake flavours were fab. What a great way to use up leftover marzipan, I love the sound of cardamom and lemon, delicious. I’ve made many a cardamom and lemon bake, it really is a lovely combination. What a great reason to bake a cake as if anyone really needs an excuse to bake a cake!!! I love your flavours lemon and cardamom. Haha, you’re probably right Johanna. How times change. Yes marzipan gives such a nice sticky sort of texture in cakes as well as good flavour. Hope things have calmed down for you a bit. Ooooohhhh lovely! Marzipan in lemony cake sounds lush, especially with a hint of cardamom. Perfectly golden and beautifully moist…… bet they didn’t last long! Oh how I wish I liked marzipan. These look so good. Stumbled, yummed and tweeted. Love marzipan baked into a cake – it adds such richness. I love marzipan so it is rare I have any left as I tend to scoff the leftovers! I always mean to make for Twelfth Night but never get round to it but these look like something I can whip up. I think they would also work well at Easter. I always think of Easter and lemons! Yes Ness, you’re right about Easter. The yellow of lemons is a good fit and of course marzipan is too.